Means of production owned by private firms. Economic freedom helps political freedom. If governments own the means of production and set prices, it invariably leads to a powerful state and creates a large bureaucracy which may extend into other areas of life. Innovation. Capitalism has a dynamic where entrepreneurs and firms are seeking to create and develop profitable products. Therefore, they will not be stagnant but invest in new products which may be popular with consumers. This can lead to product development and more choice of goods. Economic growth. With firms and individuals facing incentives to be innovative and work hard, this creates a climate of innovation and economic expansion. This helps to increase real GDP and lead to improved living standards. This increased wealth enables a higher standard of living; in theory, everyone can benefit from this increased wealth, and there is a ‘trickle down effect‘ from rich to poor. There are no better alternatives. As Winston Churchill, “It has been said that democracy is the worst form of government except all the others that have been tried.” A similar statement could apply to capitalism. Social benefit ignored. A free market will ignore externalities. A profit maximising capitalist firm is likely to ignore negative externalities, such as pollution from production; this can harm living standards. Similarly, a free market economy will under-provide goods with positive externalities, such as health, public transport and education. This leads to an inefficient allocation of resources. Even supporters of capitalism will admit that government provision of certain public goods and public services are essential to maximise the potential of a capitalist society. Inherited wealth and wealth inequality. A capitalist society is based on the legal right to private property and the ability to pass on wealth to future generations. Capitalists argue that a capitalist society is fair because you gain the rewards of your hard work. But, often people are rich, simply because they inherit wealth or are born into a privileged class. Therefore, capitalist society not only fails to create equality of outcome but also fails to provide equality of opportunity. Inequality creates social division. Societies which are highly unequal create resentment and social division. Diminishing marginal utility of wealth. A capitalist society argues it is good if people can earn more leading to income and wealth inequality. However, this ignores the diminishing marginal utility of wealth. A millionaire who gets an extra million sees little increase in economic welfare, but that £1 million spent on health care would provide a much bigger increase in social welfare. Most economists take a nuanced approach to capitalism. Supporting broad principles of free-market, but concerned with abuses of free markets, such as monopoly, inequality and externalities. However, some like Hayek are more passionate in support of limited government intervention and virtues of capitalism. All types of capitalism imply that the economy is ‘market-based’ However, within the broad term of capitalism, there are different varieties which can have profoundly different outcomes. For example, unregulated capitalism – sometimes termed ‘turbo capitalism’ will see greater problems associated with inequality, under-provision of public services and greater inequality. A primarily ‘capitalist’ society with some regulation on inequality, environment and monopoly power can create a very different outcome to a pure ‘capitalist’ society. When people talk about capitalist societies, e.g. the US, there is actually significant government intervention in areas such as education, healthcare and transport. US government accounts for around 35% of GDP. Even a country like France, where the government spend 50% of GDP has an economy which may be considered to be primarily ‘free market’. There is no clear cut point when an economy stops being capitalist and becomes a ‘mixed economy’. Interview with Brian Lamb, on Booknotes C-SPAN, 1994-11-13. ← Should welfare benefits be increased to reduce inequality? Equality of outcome is not a goal nor a desirable outcome, so it doesn’t fail to achieve it. 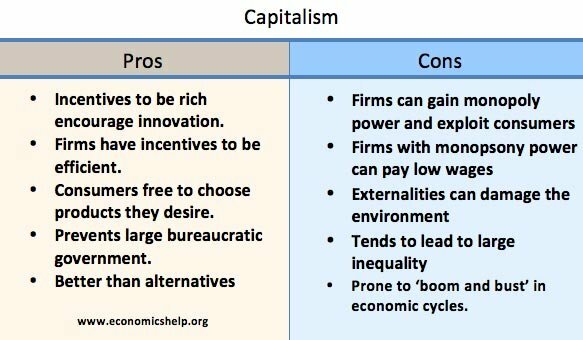 I think it is funny that a ‘pro’ of capitalism is that “It is better”. Ah, Milton Friedman preaching about freedom. How ironic that his brand of capitalism helped remove legally and democratically elected governments in S. America which were replaced by murderous dictators.